A new art exposition featuring a work by James Flames called "Houdini's Key" opens this Friday at the Design Matters gallery in Los Angeles. "Weapon of Choice!" showcases art inspired by prominent characters from fiction, history, or pop culture, and their relationship with their iconic "weapon". There will be an opening reception on Friday, January 11, from 7-11pm at Design Matters, 11527 Pico Blvd., Los Angeles, CA 90064. You can RSVP at the "Weapon of Choice!" Facebook page. For more on the exhibition visit Hero Complex Gallery. 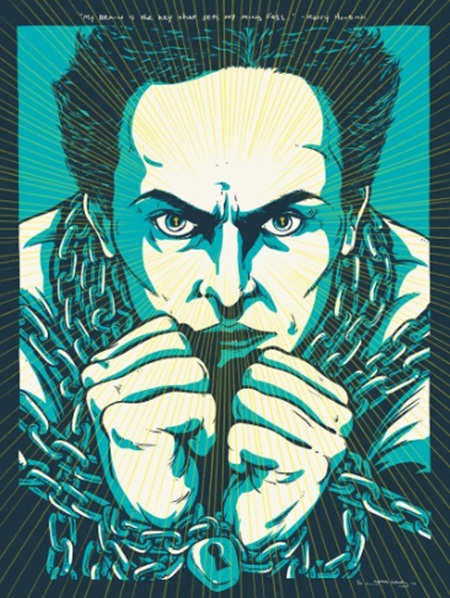 You can also buy a signed and numbered print of "Houdini's Key" for $30 via Limited Paper at Collider.